grandma's cookie jar: Special Month of Birthday Give-Aways - Two Personalized Place-Mats from Shutterfly! 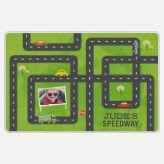 Special Month of Birthday Give-Aways - Two Personalized Place-Mats from Shutterfly! I am so happy today to let you know about a wonderful, orange package which arrived at my house yesterday; inside was two personalized placemats from Shuttterfly! These were not just "any" personalized placemats, but placemats with my grandsons' photos on them! And not only did I get to make these for my grandsons, but I'm giving away a set of two to one of you as well! First, information about the placemats! While I chose placemats with cars on them . . . since Josiah and Caleb do love cars . . . there are 25 designs from which to choose! If I had ordered these for myself, I would have chose the Gallery of 12 and the Collage Placemats . . . since I usually have so much trouble deciding which photo to use!!! I'm extremely happy with the finished placemats; and so are the boys! These make great gifts, wonderful idea for Mother's Day, Children's Day, weddings or just to add a bright, new look to your own table! As I said, not only did Shutterfly let me choose and make two placemats for review, but they are making two more available for me to give away (USA only)! If you are over the age of 18 and would like to be in the drawing for the placemats, which will be on May 7, 2014, you may enter by commenting below to share one of your favorite meals to get together with your grandchildren/children; for me, it has to be birthdays! I love to celebrate my grandchildren's - and children's birthdays! The birthday person gets to choose the entire menu, we gather family and celebrate the amazing gift of the birthday person to our family! Additional entries in this give-away are available if you follow on Google+, Google Friend Connect, follow by liking on facebook with the tab at this link (not just liking the post) and/or have followed grandma's cookie jar by email. For each of these which you have done you will receive one entry. In addition, if you "share" this post, you'll receive an additional entry (please let me know if you share!) This will help me be able to draw names from among people who would like to win the placemats (if you win you will be able to choose whichever one design or two designs you want) and it gives you several ways to enter the give-away! Thank you for reading grandma's cookie jar and for sharing it with the people you know! My favorite meal to share with family is also birthdays...this year my twin granddaughters will turn 3 on Thanksgiving...these placemats would make delightful birthday gifts. I follow on fb and email. Sunday morning breakfasts are my favorite! We get up, the kids come in our bed for a cartoon or two and then we make a big breakfast! Would love these thanks! I love to get together for thanksgiving, christmas and easter. Those big dinners when grandparents and aunts and uncles are there also. The kids have such a great time and everyone is just so happy. Favorite meal to get together would be our Passover Seder! Love when the whole family gets together!